Fast growing, upright becomes broadly rounded with age and reaches 35 feet tall. 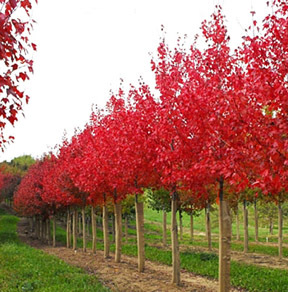 New foliage emerges vibrant red, turns dark green in summer and brilliant orange to fiery red in fall. Smooth, light gray bark becomes deeply ridged with age. Showy red flowers precede foliage on intriguing reddish branches. Early red fall color. An old favorite, Autumn Flame is not as popular as it used to be due to new available cultivars. An excellent large lawn tree. Native to eastern United States. Leaf Description: New foliage emerges vibrant red, turns dark green in summer and brilliant orange to fiery red in fall.